Material and apparatuses for carrying out exercises aimed at maintaining the physique and increasing muscular strength, flexibility and endurance. 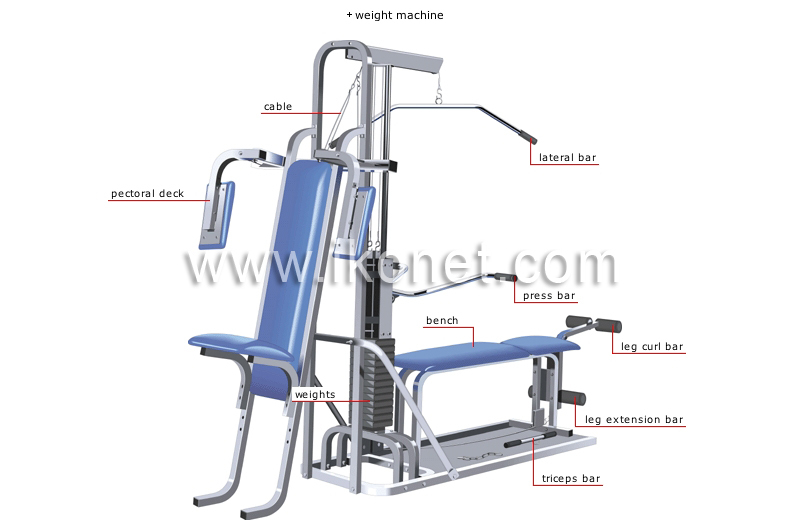 Apparatus for carrying out various exercises that consist of lifting or pushing loads to strengthen muscles. Padded seat that is long and narrow; the user lies or sits on it to perform weight-training exercises. Lying on the stomach with the calves under the bar, the user lifts the bar using the muscles in the calves and the back of the thighs. When interchanged with the lateral bar on the cable, the user sits on the bench and pulls the bar down behind the neck; this develops the triceps (arm muscles). Lying on the back, the user pulls the bar downward with the arms; this strengthens the chest muscles. Sitting on the bench, the user pulls the bar down to chest level using both arms; this strengthens the back muscles. Lying on the back with the legs under the bar, the user lifts the legs to the horizontal position, using the front thigh muscles. Heavy units serving as the weight machine’s resistant forces; they are regulated by adjusting the height of the weights to be lifted. Apparatus with two handles that the user brings together with the arms until they touch; this develops the chest muscles. Steel wire that connects the weights to the machine’s apparatuses.